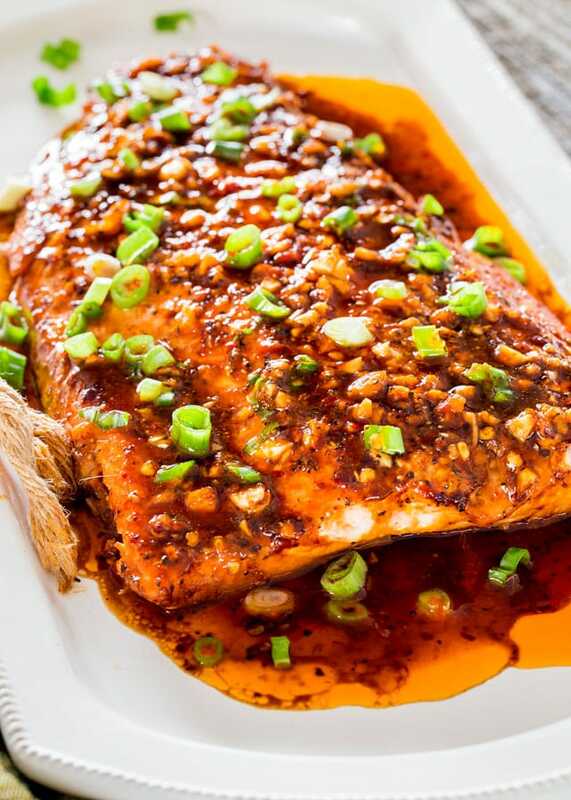 Perk up your dinner tonight with this Firecracker Salmon. 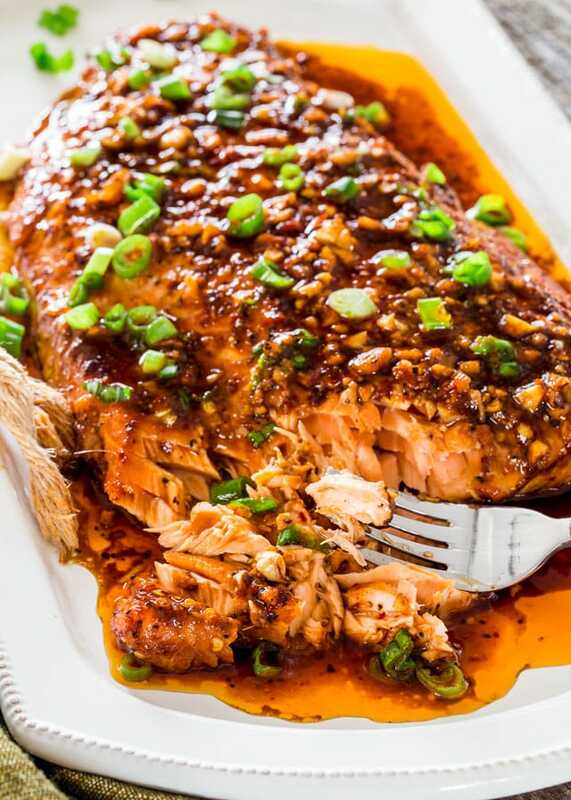 Red pepper flakes and Sriracha sauce provide this salmon with some fiery flavor that give this salmon its name. Let me cut to the chase here. Because as far as fish goes, this is probably as incredible as you’re going to get. I’m not being biased or anything here, I’m just telling you now you’re going to love this salmon. I’m beginning to get an unhealthy obsession with anything Sriracha. This is coming from someone who never used to eat spicy anything. And now look at me, I put it on everything. Back when I worked in IT, we used to follow the KISS principle when it came to developing applications, keep it simple, stupid. I like to follow that same principle in cooking most of the time. So if you can manage to whisk a few ingredients together and pour it over the fish, then you can manage to make this simple recipe. Now you may look at this salmon and because of its color and its name you’re going to think that this salmon really is so hot that you won’t be able to touch it. Well, it is a bit spicy but I added some brown sugar into the marinade to balance off the spiciness with a bit of sweetness. Trust me on this, it works, this marinade is the bomb. You will want to marinate your fish for at least a couple hours. I believe I left mine in there for 2.5 hours and the longer you leave it, the tastier it will be. Then simply bake it for about 15 to 20 minutes, this really depends on the thickness of your salmon, it might take a bit more if thicker. You can also use salmon fillets if you don’t want a big piece of fish like this, especially if you’re serving it to guests. 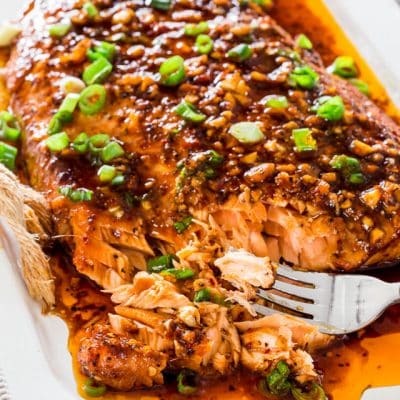 If you want to grill this salmon, I would recommend putting it on a large aluminum foil that you can fold up around the edges, so that the marinade can sit in there, then you can grill it with foil and all. I would serve this over some plain steamed rice, or with a side of steamed vegetables like broccoli and cauliflower. In a small bowl whisk all the marinade ingredients together. Place salmon in a baking dish and pour marinade over the salmon. Rub the marinade over both sides making sure the entire salmon is covered. Cover the baking dish with plastic wrap and let it marinate in the fridge for 2 hours up to 24 hours. Remove the plastic wrap from the baking dish and bake for 15 to 20 minutes. Note that the baking time could vary depending on the thickness of the salmon. Garnish with chopped green onions and serve immediately. Feel free to adjust the amount of sriracha and pepper flakes to your preference. You can use skin-on salmon if that's what's available to you. 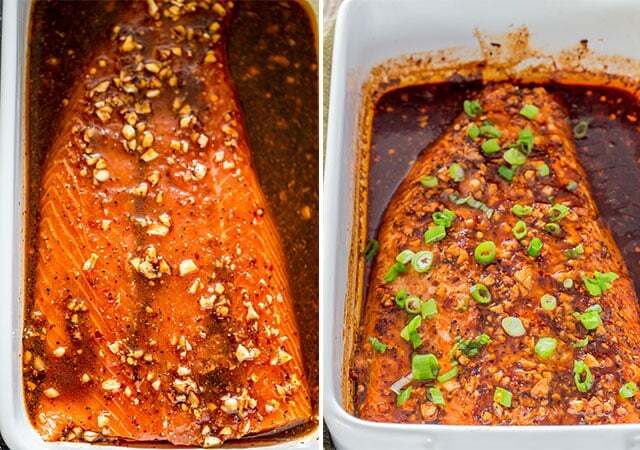 Total time does not include time required to marinade the salmon. This is the best salmon recipe I’ve tried! I marinated overnight and didn’t change anything! Can’t wait to make it again. Holy wow! I am one of those people that depends on google for recipes but never comment or rate. I couldn’t stay silent on this one! It was soooooo good and I had extra rice to soak up the sauce. Thank you for sprucing up my salmon game! Thank you so much, Amy! We’re so glad you love this recipe that much 🙂 Enjoy! Tried this tonight OH MY WORD! This was so good! When I sampled the marinade I didn’t think it was spicy enough and added 2 tablespoons of Chili Garlic Sauce by Huy Fong Foods. It made it! The wife and I had to force ourselves to stop eating! Thank you Jo! Really a great recipe! Easy to prepare! So happy you guys like it! What a splendid idea. I love salmon! Living in the Pacific NW, it’s the ‘go to’ fish. I have never eaten it prepared with a bit of Zing. I look forward to giving this a try. Delicious! My family’s favourite salmon recipe! That’s what I love to hear! Outstanding. My middle son Nate, who is typically not a big salmon eater, was reaching for seconds. Will make this recipe again for sure. Always pleased with Jo’s recipes. Paired it with an easy cilantro lime rice and Parmesan roasted carrots. Thank you Jo. My pleasure, glad you guys enjoyed it! Finally got my act together and made this yesterday. SUPER! Disappeared so fast I never had time to take a picture. Hubby was well impressed, and probably could have snarfed another serving or two. Years ago we were gifted several fresh salmon (huge ones) from a fishmonger who bought tyres from hubby’s shop. I took them home, cut steaks, filets, and froze enough to last for months. After that, we could hardly face salmon again. 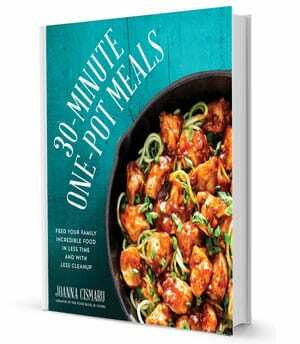 I don’t cook it often, but with this recipe, it’s definitely back on the rotation. I can honestly say, this was one of the easiest and best fish dishes I’ve made in months. Thank you Jo! Every recipe I have tried has been good. Unlike some blogs, your dishes are doable for almost anyone. And the taste is always superb. I’ve been cooking for 50+ years, but still like to expand my horizons. Made this with the Greek Potatoes and everything was absolutely delicious! Will be searching for more things on your site to fix. Thank you!! Absolutely delicious and possibly my favorite salmon recipe EVER!!! Definitely a keeper….easy to make and definitely company worthy!!! Making it again for company this weekend!!! Served over Israeli Cous Cous (sautéed with garlic and shallots) and broccoli (steamed and sautéed with garlic, shallot and a bit of soy). So unbelievably fantastic I cannot believe how flavorful. Need to (at least) double the marinade recipe so we have some extra extra to drizzle over the Cous Cous and veggies!!!! YUM!!!!!! 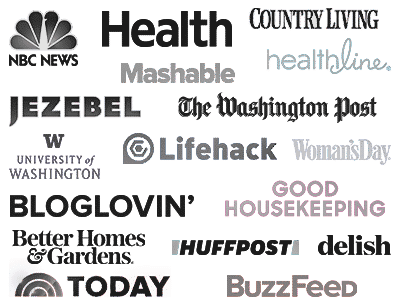 You are my new FAVORITE go-to site for recipes and inspiration!!!! Thanks, John! I appreciate the comment! So glad you enjoyed this, Jacqueline!